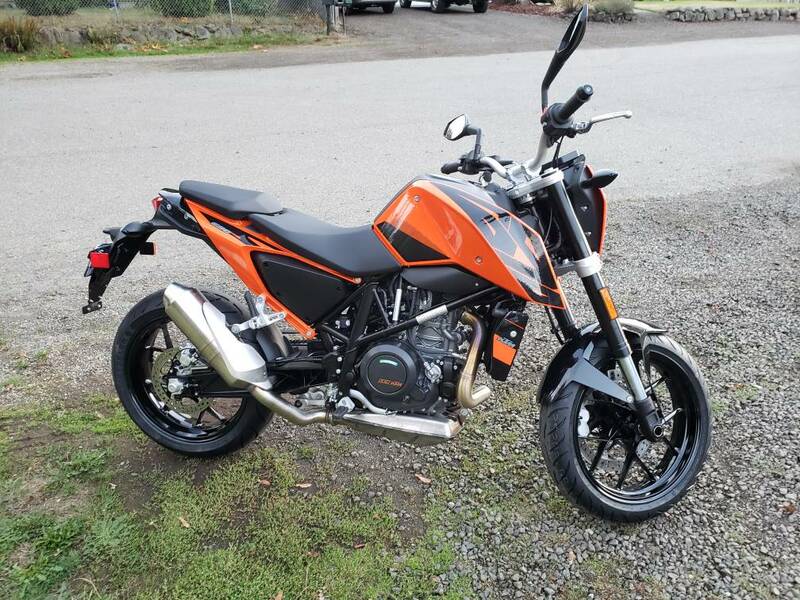 KTM 690 Duke or Suzuki DRZ-400SM? Congratulations. I'm surprised how smooth large singles can be, especially new KTM/Husky's with the additional balancer in the head. Even though the size of that piston will inherently make it shake more on larger singles, it's all in the execution. I've got a '07 Husky 610 and it's vastly smoother than my 450cc GasGas. Picked up the new ride today. Was only able to put about 30 miles on it and I am following the break in guidelines but it's pretty fun. Right off the bat the seat is more comfortable than the DRZ. Power is better even while limiting RPMs to less than 6k and not twisting the throttle as far as I'd like to. The suspension is really soft but I knew that going in. I noticed that at lower RPMs is does shake the bars (and mirrors) quite a bit but seems to smooth out as they come up. I'll try to pay more attention to that aspect as I ride it more and evaluate how my hands feel over time. Initial assessment makes me feel that I'm really going to enjoy this bike once I get out of the break in period. So far it really seems to serve the purpose I intended. Oh, and the deets on the deal, I paid $7932.20 after the state finished with me. Willow, FeralRdr, Rusty Nail and 1 others like this. funny thing about the LC4 - it likes to rev and not be lugged, even though it is a low-rpm motor. that new motor with the counter-balancer shafts is supposed to be a LOT smoother.